Muscat Bay is located on the north east coast of Oman. The site is approximately 25km south east the capital, Muscat. The site covers an area of approximately 219 hectares set against a backdrop of rugged mountains, verdant valleys and a sweeping beach. 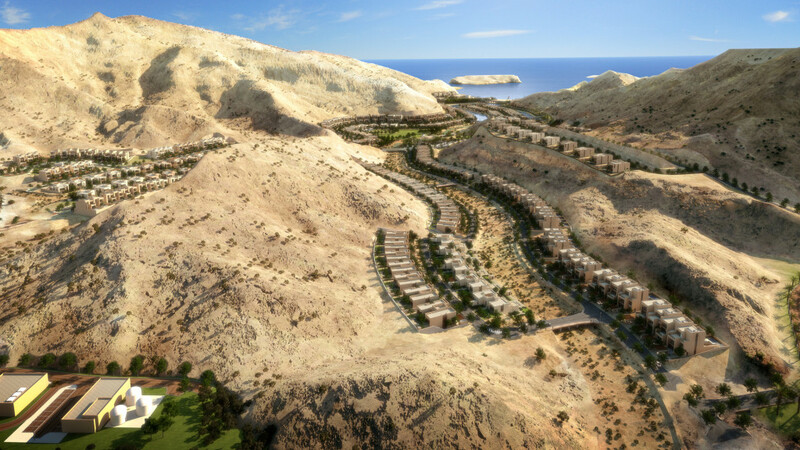 The development is an exclusive luxury resort including an integrated community, nestled within a sheltered bay where the mountains of Bandar Jissah meet the Gulf of Oman. The resort combines a range of residential typologies and recreational facilities within the valleys, as well as two luxury hotels adjacent to the beach. 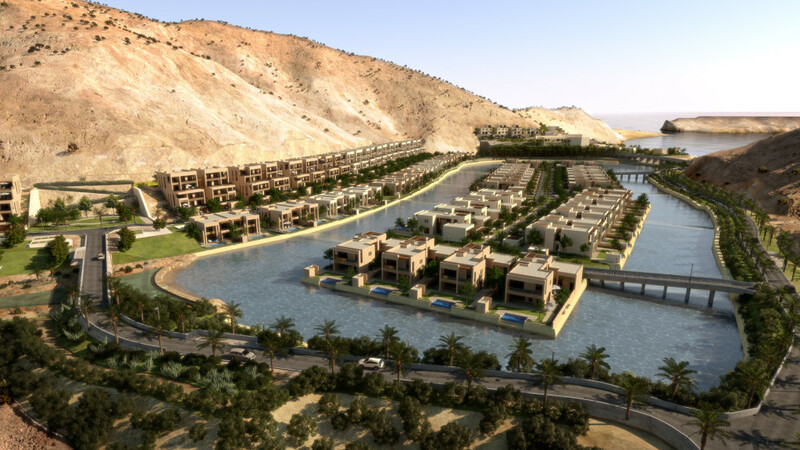 Central to the resort are the wadis and lagoon. From the highest point, two dry wadi systems, planted with arid species, flow towards the centre of the site. Where they meet, water is introduced and a small stream meanders through a public park on its journey through the site. All the buildings have been designed with the intention that the resident or guest can feel connected to the external environment. Stunning views are framed by strong architectural forms. Large windows slide away to connect the interior with the exterior, allowing the spaces to flow together. The interiors are shaded from the sun by deep recesses and mushrabiya screens, without compromising the views. The mountains and the wadi become part of the internal environment. 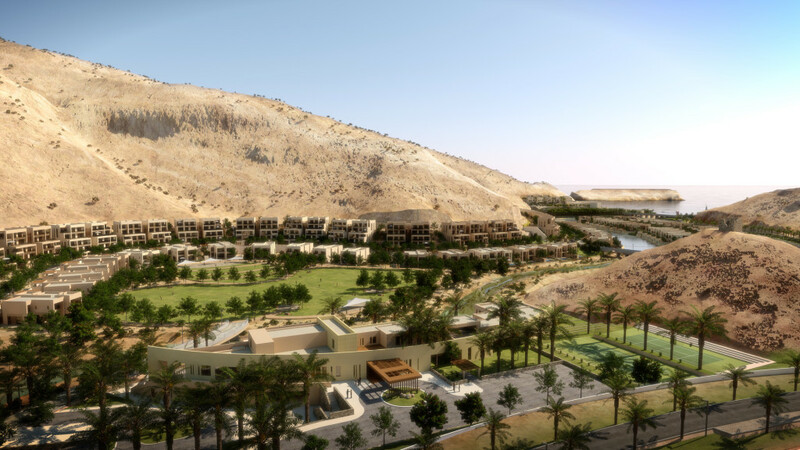 Weaving through the valley, an artificial wadi will be introduced into the site, providing irrigation for the palm groves and naturally cooling the micro-climate of the valley floor for the developments. 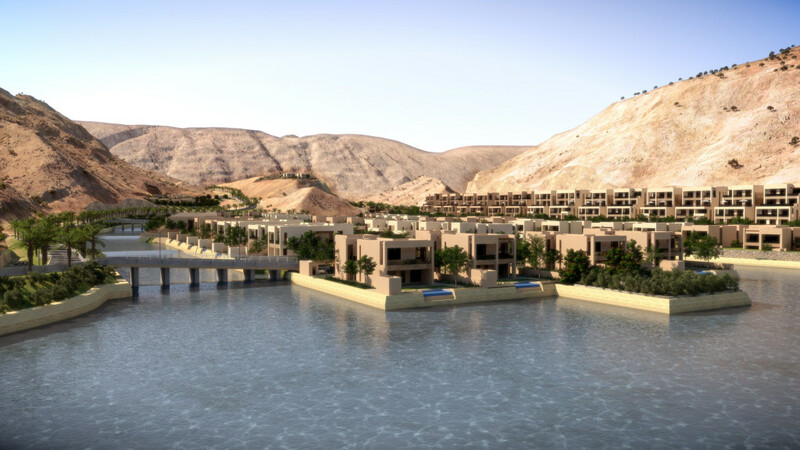 The wadi as a waterway transportation link, connecting the 7-star hotel to the spa, or simply offering a tranquil way to experience and explore the site. In an area of such outstanding natural beauty, a strategy of minimalist overall intervention on the existing terrain will be implemented to maintain the existing environment. 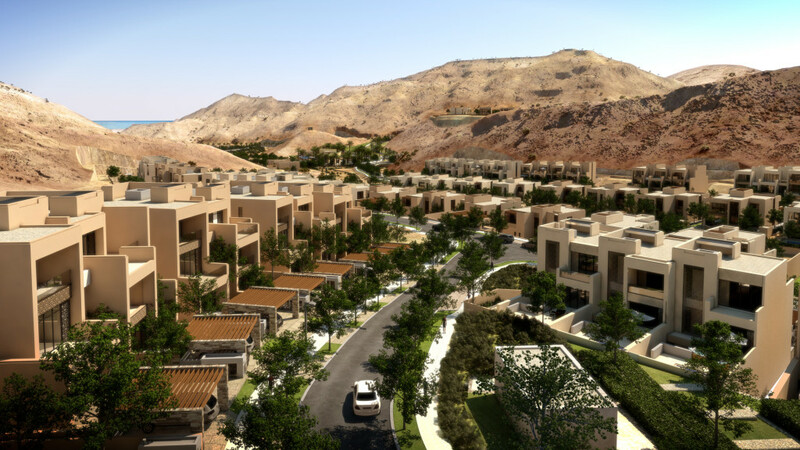 Carefully integrated architecture based upon traditional local responses will ensure that the development’s visual mass is kept to a minimum, thus providing the guest and resident with a truly unique Omani experience.